Maureen Simon is the founder of The Essential Feminine Company™ (TEF). A lifestyle and business design company that supports women through the process of creating successful powerful lives that incorporate their uniquely feminine attributes and gifts. The company provides learning environments and products that assist women in claiming, living and leading with their natural strengths and talents. Maureen’s commitment to TEF is grounded in her belief that now is the time for women to step forward and make their major contributions in the world.Maureen's experience includes more than 25 years of successfully mentoring and guiding women leaders from around the world to create successful lives and businesses that reflect their authentic values. With her experience in intuitive psychology, Maureen acts as social alchemist - able to see and nurture the whole person and act as the essential catalyst for each individual’s issues, especially those requiring transformation. Her life-changing work as a career consultant for women includes supporting them to reduce economic stress and to open new channels for both personal and business expression while enhancing their abilities to access the deeper powers and gifts that each one holds within her feminine essence. As a highly intuitive business and life designer, Maureen incorporates principles of mysticism, alchemy and social entrepreneurism to achieve focused client outcomes and transformative results. 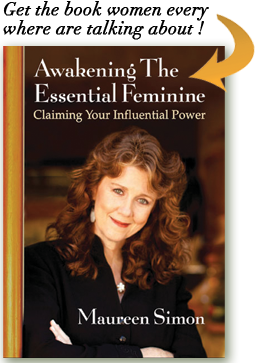 Through her work supporting women in designing lives and business that align with their spiritual destiny, she has developed an approach that awakens every aspect of the whole woman called Awakening The Essential Feminine™: Claiming Your Influential Power.Maureen’s clients hail from a wide range of international businesses –including Fortune 100 corporations, entertainment and media industries, government and the arts. Her mentoring skills have met equal success with global executives, local visionaries, creative spirits and mid-career women. She is a founding member of the Global Women's Leadership Network at Santa Clara University's Leavey. December 8, 2016 Day to day power- are you using yours? November 10, 2016 How Peaceful You Are, especially when life throws you a hard ball?